A Washington, D.C. native, Mary Jean Lindner has always lived in the area. Before moving to their condominium at Fox Hill, she and her husband Thaddeus lived in an apartment at the Watergate. Thaddeus belongs to Burning Tree Club next to Fox Hill. They watched Fox Hill develop from the ground up, and it felt natural for them to move here. “We’re very happy with the choice,” she says. At the Watergate, they were used to having restaurants and other conveniences of Washington, D.C. nearby, but they knew only a few of their neighbors because there were no organized activities. Fox Hill changed that; now they enjoy the company of many new friends and the convenience of being able to join them for lunch or dinner at one of Fox Hill’s four gourmet restaurants. 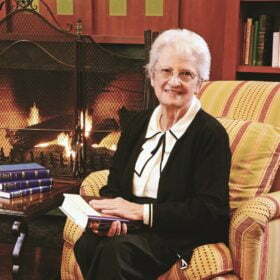 A graduate of George Washington University, Mary Jane is an avid reader and serves as chair of the Library Committee. “I read a lot and always have,” she says. “It’s a perfect fit.” She and other members of the committee stock the library with magazines, newspapers, bestsellers and other favorite titles. The Lindners work out twice a week with the guidance of Anthony Absalon, Fitness Manager at Fox Hill’s Fitness Center. “It’s wonderful, and he’s very good,” says Mary Jane, who appreciates Absalon’s sensitivity to seniors’ health issues. As a result, they are more active now than before they moved to Fox Hill. When the weather doesn’t allow for exercising outdoors, they also enjoy walking inside the community.